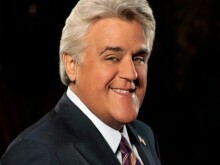 Jay Leno is host of NBC’s “The Tonight Show With Jay Leno. ” Leno has been the host since May 25, 1992. Jay Leno’s “Tonight Show” is a distinctive mix of comedy led by his nightly topical monlogues) guest interviews and musical performances, combined with the upbeat and recognizable music of Grammy award-winning saxophonist Branford Marsalis and “The Tonight Show” band. Since Jay Leno became host, the program has received numerous Emmy Award nominations. Leno was named the best political humorist by Washingtonian Magazine and TV Guide named him one of the “Best Loved Stars” in Hollywood in a recent issue. As an added bonus, “The Tonight Show” was named favorite television show in Europe where it airs on the NBC Superchannel in more than 32 countries. Prior to becoming host of “The Tonight Show,” Leno had been the exclusive guest host of “The Tonight Show Starring Johnny Carson” since September 1987. Jay Leno first appeared as a guest on the show March 2, 1977 and after numerous appearances on NBC’s “Late Night With David Letterman,” Leno was named one of several on-going guest hosts in September 1986. One of the country’s premier comedians, Jay Leno has appeared and performed in as many as 300 comedy shows each around the United States for the past 20 years. In 1991 Jay Leno performed in the Middle East to entertain thousands of American military men and women stationed there. Jay Leno remains passionate about performing in front of live audiences and appears regularly in Las Vegas, on college campuses around the U.S. and other venues. Jay Leno also has published four versions of “Headlines”: compilations and desk calendars featuring his favorite newspaper humor. He recently completed “Police Blotter,” a book with more humorous newspaper clips involving police stories. Proceeds from the book sales go to various charities. Jay Leno was born in New Rochelle, NY and was raised in Andover, MA. Jay Leno and his wife Mavis live in Los Angeles. In his spare time, Jay Leno enjoys working on his collection of classic cars and motorcycles. Do you want to hire Jay Leno? Directly request a quote. In 48 hours we can send you the availability of Jay Leno If you would like to book Jay Leno, Entertainment Booking Agency is the right place. We will offer you the best price and contact the management or we directly contact Jay Leno. For corporate appearances or speaking engagements you can contact our agents and the will help you true the process. Tags: hire Jay Leno, Jay Leno booking, book Jay Leno, Jay Leno appearances, find more information on booking Jay Leno for appearances, Jay Leno speaking engagements, Jay Leno endorsements/spokesperson, Jay Leno appearance fees, Jay Leno booking agency contact info, biography of Jay Leno, Contact an artist booking talent agent find a speakers bureau that can book Jay Leno, speaker booking agency for Jay Leno, Jay Leno booking agency, Jay Leno booking for corporate event. EBA is one of the biggest entertainment booking agencies in the World. We book hundreds of celebrities, artist, athletes and speakers in a year. Important to know is that we are not claiming to be the management of Jay Leno. We are not the official agent for Jay Leno. Companies from around the globe book these artists and speakers true our company be course we have one of the biggest networks and we always have direct contact with the artist or the management. We help you to find the right celebrities for your corporate of private events. Please contact one of our agents to get free advice and we will help to get the world-famous artist on your party.